Chathoth family, a family of St.Thomas Christians, was founded in a small village Vallamkulam, six kilometers to the east of Thiruvalla, Kerala, India about one one hundred and fifty years ago in a small way by members of other well known St. Thomas Christian families. Although Christianity is a minor religion in India as a whole, Kerala was home to one of the oldest Christian communities in the world and is a significant proportion of the population in Kerala today at well over 20%. St. Thomas Christians have a history dating back to the first century AD as seen below. Historical reference to the origin of the Chathoth family is found in the family history book of the famous Kandathil family, another St. Thomas Christian family that originated in Vallamkulam. The book was first published in 1926. Kandathil founding family purportedly moved into this paddy field home in Vallamkulam in AD 1819. History aficionados will connect the period to the reign of the famous poet-king of Travancore, Maharaja Balaramavarma (1813-46), popularly known as ‘Swati Thirunal’. 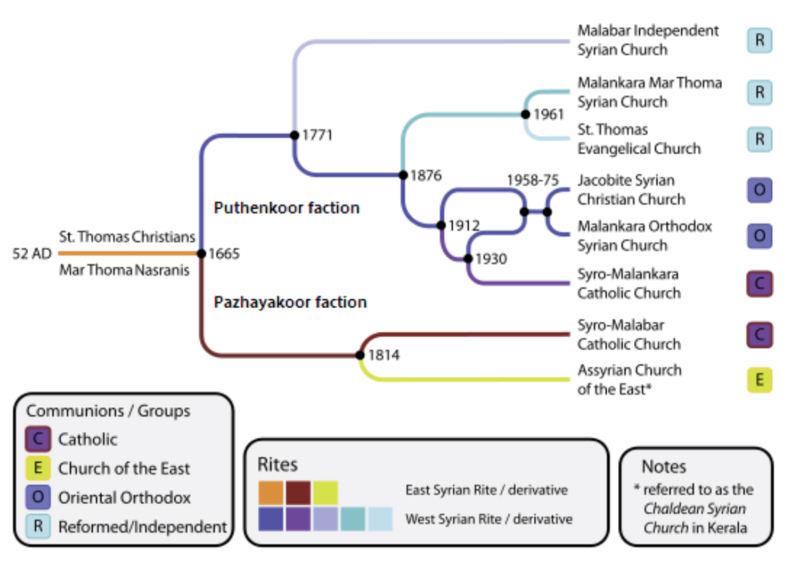 From the Kandathil history book we say that Kochuchandychen of Thiruvalla Konkara family reached Vallamkulam under circumstances that are not clear from the narrative, and later set up the Chathoth family adjacent to them. This property is still called Chathoth although the ownership changed hands a long time ago. 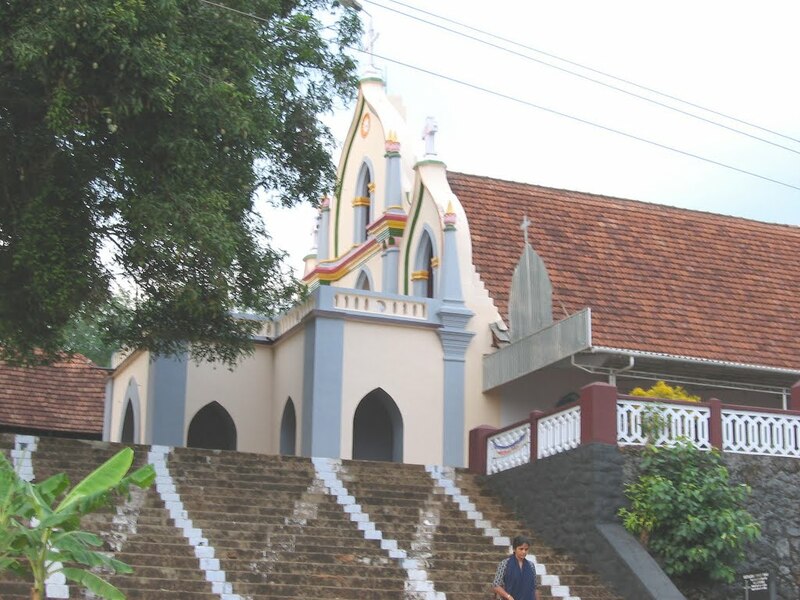 The family has been affiliated to Malankara Orthodox Church near Thottabhagom, known by the name of Kaviyoor Sleeba Church (Church of the Cross at Kaviyoor), since it was founded over 100 years ago. 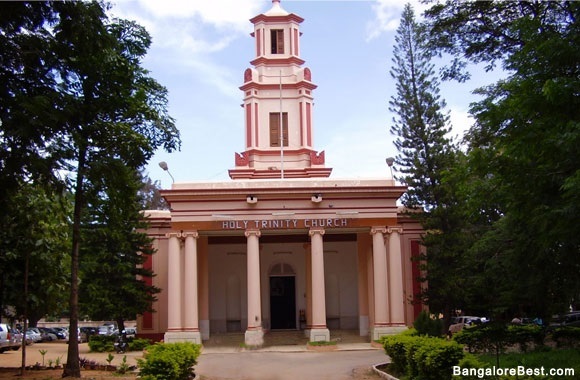 The church was consecrated in 1897 by the legendary Bishop of Parumala, the first canonized saint of the Malankara Orthodox Church. The first wedding in this church was of Kochuchandychen’s grandson Icca with Rahelamma, who did not walk to the church, but was ceremoniously carried to the church for the wedding! Here on the left is a picture of the old Kaviyoor Sleeba Church. Boy, I would have liked to be carried to the top! And on the right is the new church which was consecrated in April 2015. The family had its ups and downs through the World War years and finally many of its members settled in Bangalore and eventually spread out globally. The ancestral village is dear to the hearts of many of those settled elsewhere. Holy Trinity Church, M.G. 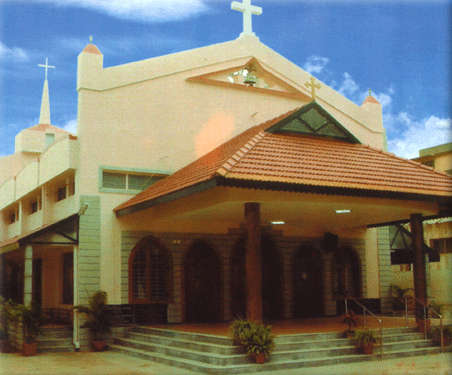 Road, Bangalore was the church for Malankara Orthodox Christians before 1972. My dad, C.C. Abraham (Thampychayan) worked on the wish of his uncle C.I. Thomas (Kunjommachen) along with C.I. Jacob (Joychayan), the senior-most members of the family at present, researched, compiled and published a family history book which is now available as a download from the family history page . There are lots of stories to tell and lots of memories to cherish. What next? Well, if you are a family member, you could do two things. You may want to head out to the Geni website to update your profile there. The stub of the family tree is already in place, and chances are, your name already appears there! If it doesn’t, you can always get it appended easily. Secondly, you may have comments, questions or concerns. We need dialogue process for the best results. You may either post your comments below or send your information from the contacts page, or you may send an email to chathothfamily.AT.gmail.com. If you are not a family member, but you wish to connect for good reasons, this is your opportunity! Fill out the form in the contact page: we would love to hear from you! And, last but not the least, why is Vallamkulam, a little village, important? I have been fascinated by S.K. Pottekkatt’s novel ‘Oru Desathinte Katha’ or ‘The story of a village‘, more precisely the story of a little village called ‘Athiranippadam.’ The book won the Kendra Sahitya Academy Award in 1972, and Jnanpith Award in 1980. Another little Kerala village that comes to mind is Aymanam. Remember ‘God of Small Things’ that won, guess what, the Booker Prize in 1997? Someone could write a similar story about Vallamkulam one day! I see the same potential, if not more, for Vallamkulam. Now really the least question: Who am I? I am Shibu or Alex Abraham, reporting from Canada. Hi! Dinosaurs in 1819 ? Are you sure ? What an amazing website! Congratulations to Thampichayan, Shibu, and all family members who took the initiative and put in the efforts to create such a website which brings back good times and connects generations by taking us on a walk down the memory lane!! After reading this wonderfully energizing creation, I became nostalgic for the golden days of my childhood spent with my eldest sister, Jolly Abraham, member of the Chathothu family, Vallamkulam. Playing with Shibu in the Chathothu yard, Achayan and Amma’s advises, love and care, both gathering mangostein fruits for me during my vacation visits from boarding school, Chathothu house itself-that gave me a complete sense of home in that tender and young age — all these memories came rushing back to me. May Achayan and Amma’s soul rest in peace along with all others who passed away for heavenly abode!! Peace and good wishes to all Chathothu family members!! And I remember Jayamama repairing my torn school books as a pleasant surprise those days. Thank you! Not torn from too much reading, though! Oh Great! Thanks Jaya,lots,for frankly sharing the pleasant memories of your visits to the Chathoth house, in your childhood days.Such reflections evoked by sisterly love and affection are felt as fresh cool breeze in our cognitive domains. An important aim of family websites is to kindle such reminiscences for fostering and strengthening such relationships. We are extremely glad that you have launched such vivifying interactions in our Website. Came across the website while googling the family name “Konkara”. I am very pleased to learn that Chathoth family has its roots from Konkara. My Grandmother is from Konkara, Thiruvalla. ( Kunjoonjamma, D/O – Late Oommen Konkara, who was a well known businessman in Thiruvalla.) I have heard from her regarding the connection to Kandathil as well. Would it be possible to get the password to open the Chathoth History PDF and view the genealogy chart on Geni as well ?